"When I left the big brokerage firm to become independent, I started with a small book of business. That didn't matter to Schwab. They saw my conviction and understood where I wanted to go." Find out what going independent could mean for you. What it means to go independent. Be your own boss and shape your business terms the way you want. Increase your income potential—as an RIA, you have 100% control of your payout. Gain greater control over how you can market to and communicate with clients. Access more technology options for scaling your business and creating your client experience. Get more details. Download our in-depth white paper Exploring Independence. RIA is the fastest growing advisor channel of the past 10 years. There are substantial reasons more and more advisors are choosing to go independent. They’re seeing greater opportunities for themselves and their clients. And there are more options for running a business and customizing client experience. Most importantly, clients are seeing the value of putting more trust in independent RIAs. If you’ve been thinking about it, now is a great time to make the move and Schwab can help you. Project your earning potential. Test different business scenarios using the RIA Economic Discovery Tool. 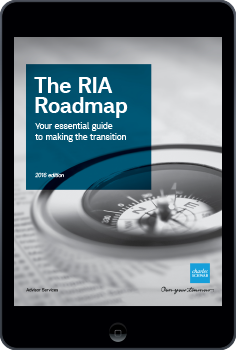 The RIA Roadmap provides you with the key steps to help you start your journey to independence as an RIA. Charting your own course helps you understand the RIA model and the path to independence that's right for you. Going independent as hybrid RIA helps you understand the considerations you face when choosing the hybrid model. Complete this form and the guide is yours to download. The form below helps us connect you with the right people to answer your questions about transitioning to an independent RIA. We also may use the information to send you additional insights from Schwab Advisor Services. Advisor stories: Life as an independent RIA. Advisors from Berkeley Capital Partners in Atlanta, GA share their experiences of becoming and working as an independent RIA firm. Berkeley Capital Partners: Our Story of Independence. This is a transcript of unscripted speech, rather than written prose, and therefore should not be relied on for grammatical accuracy. This is not a verbatim transcript. Parts have been slightly modified to improve readability. Berkeley Capital Partners is a registered investment advisor in Atlanta, Georgia. We manage all of the assets of our firm in house. We have grown our business through family, friends and their referrals and we treat everyone as such. Choosing to go independent was a conscious decision to get away from having mangers manage us. The day we actually all agreed that this is the path we wanted to pursue, the major pro was the client and you’re able to do what’s in the best interest of the client and there’s nothing that prevents you from doing your job. Schwab is agnostic as to how you manage assets. They really leave it up to you to do what you think is best for your clients. Schwab provided a significant amount of resources and had an integral part of our successful transition. Transitioning a business is never easy, it’s never without stress. One of our own fears was us being responsible for our own compliance. When we moved to Schwab they had a team that came in, they helped us identify those issues and it turned out to be very helpful. Communication with the clients relative to the move ended up being significantly easier than any of us expected. They said, “Well do you really think it’s the right thing for me?” And we could say unequivocally yes. I have the ability to manage money any way that I see fit. Clients can sense our passion and our excitement about being able to do things we couldn’t do before. The clients that were our clients that were entrepreneurs really started referring us more business than they normally had. Business owners respond to other business owners. Our firm’s experienced the best growth rate in our history. I consider this more than just a business, you know we consider it like a large extended family. It’s more of a team feel and less of a competitive feel. The ultimate goal is just serving the client and everybody will do fine, you know if we do that. There’s tons of freedom being independent, um with the technology you have access to, you can work from anywhere and still get great results. So the fact that I can do my job wherever I need to be has allowed us to travel more, spend more time. I try to work from home 1 to 2 days, maybe 3 days a month. Because I now run my own business I have that freedom now to do what I think is best for me and my family. Don’t focus so much on the fear of the move and the fear of the front end but focus on what you can do on the back end and long-term, you know the trajectory will put you on for your customers and for yourself personally. We don’t know how it’s gonna all shake out but we do think we’re in a better position to be agile. Being independent isn’t for everybody, you have to have the right business mix but if you do, I think with the way the industry’s changing, you should look into it and you should probably look into it as soon as possible. Information included during this video is intended to be an overview and is subject to change. Experiences expressed by advisors may not be representative of the experience of other advisors and are not a guarantee of future success. Berkeley Capital Partners, is not owned by or affiliated with Schwab, and its personnel are not employees or agents of Schwab. This video is not a referral to, endorsement or recommendation of, or testimonial for the advisor with respect to its investment advisory or other services. Schwab does not supervise third-party firms and takes no responsibility to monitor the services they provide to you. Experiences expressed are no guarantee of future performance or success and may not be representative of your experience. Schwab does not provide legal, regulatory or compliance advice. Consult professionals in these fields to address your specific circumstance. Schwab Advisor Services™ serves independent investment advisors and includes the custody, trading, and support services of Schwab. Independent investment advisors are not owned by, affiliated with, or supervised by Schwab. ©2017 Charles Schwab & Co., Inc. (“Schwab”). All rights reserved. Member SIPC. Advisors from Quadrant Private Wealth in Bethlehem, PA discuss forming their independent RIA firm and the support they had throughout the process. Quadrant Private Wealth: Our Story of Independence. We’re Quadrant Private Wealth, we’re located in Bethlehem, Pennsylvania. The firm is only three years old, the building is 170 years old. We're investing in something that has some history to go with it, and we're just beginning to build a history of our firm. I learned many years ago that clients and advisors need to be on the same page. Working at the warehouse was like being eaten alive by goldfish, it was one little nibble at a time. Where there wasn't one thing that caused us to say, “boy, we’re in the wrong place”, but it was an accumulative effect of a lot of little things that we realize that our clients were better off, that we’d be better off, if we had an open independent fiduciary model. We knew it was going to be hard work when we went from wirehouse to independent. The biggest concern I had was the old adage of “Not knowing what you don't know”. I knew that we needed technology, I knew that there would be compliance, I knew we would need operations, I knew we would need HR. I think the real turning point for us was when we met the folks at Focus Financial Partners. They handed us a spreadsheet, I think it was a 250 to 300 point spreadsheet that said this is what you guys are going to have to accomplish in the next six months to make this work. At the same time we are also serving clients, it really was a second job forming Quadrant. Schwab too, was an integral part of executing that transition smoothly. In a custodian we were obviously looking for someone that could safeguard our client assets, but also provide all the technology and all the support that would allow us to focus on what we do best, which is working with clients. Schwab took care of all that for us. Our clients’ reaction to our move has been positive at every step. They’re on this journey with us, I think they appreciate the entrepreneurial spirit. We’re now in a position that we can provide unconflicted, prudent advice at every step of the way. I have a great sense of pride in how I've grown personally and how the partners have grown professionally truly in running a business, there are still a lot of things that we need to learn but ultimately it's going to make us much better advisors to our clients. Every day you will encounter things that you never could've foreseen, and yet despite the fact that that’s extraordinarily challenging it's absolutely rewarding. It's nice to be able to look back and to start dreaming about the possibilities that continue to exist as we evolve our client relationship and as we mature in this business. It's more work than we ever thought, but it's more worth it. It took us 3 1/2 years to renovate this historic building. It didn’t take us quite that long to get our business up and running but they were both just tremendously rewarding projects, where when we look back on it, we made the right decision three years ago and couldn't be happier looking forward. Quadrant Private Wealth is not owned by or affiliated with Schwab, and its personnel are not employees or agents of Schwab. This video is not a referral to, endorsement or recommendation of, or testimonial for the advisor with respect to its investment advisory or other services. Focus Financial Partners is a partnership of independent wealth management firms and one of many consulting options potentially available to transitioning advisors. Focus Financial Partners and their employees are not affiliated with or employees of Schwab unless otherwise noted. Their mention should not be construed as a recommendation by, endorsement of, or sponsorship by Schwab. The views expressed are those of Quadrant Private Wealth and are provided for informational purposes only. Experiences expressed are no guarantee of future performance or success and may not be representative of you or your experience. You must decide whether to hire any firm and the appropriateness of their services for you or your firm. ©Charles Schwab & Co., Inc. (“Schwab”). All rights reserved. Member SIPC. Advisors from the RIA firm Concentus Wealth Advisors in King of Prussia, PA talk about going independent—and why they wished they’d done it sooner. Concentus Wealth Advisors: Our Story of Independence. Our story of independence. Concentus Wealth Advisors. Concentus is located just outside Philadelphia in an area called The Main Line. We grew up here so we’ve been in this area for a long time, and I think that shows in our business and our clients. We’ve really tried very hard to work on developing a family based culture. We try to treat everybody that way as if they were members of our family. The culture from the base to the top is integrity, integrity over everything. The model at the wirehouse was broken. We wanted to have freedom of thought and own our own business. So we started along the road of looking for the true independence. The first time I heard about the idea of being an RIA, it really was very early on in my career. I always thought it was the best platform for really best serving your client. We were introduced to Dynasty Financial Partners through Schwab. They call themselves an outsourced middle oﬃce for independent registered investment advisor firms. They power our independence. They help us go independent and be successful at being independent. There are a lot of fears about going independent. The wirehouse has done a very good job of convincing people that it’s dark on the other side. Technology’s not as good, the products aren’t as good, and I found none of that to be true. The one fear you don’t have to have is: “will the clients go with me?” If you’re afraid of that then you haven’t been servicing them in the first place. Our clients followed us, and they said repeatedly: “I’m not a client of your previous firm, I’m a client of yours.” That was probably the thing we worried about the most and was the thing we probably needed to worry about the least. We knew that when we were gonna be going to talk to our clients about the fact that we’re recommending they use Charles Schwab as their primary custodian, we weren’t gonna have any push-back. That feeling of safety of assets permeated everything that our clients understood about Charles Schwab. All I had to do was focus on the thing that I’m best at and that I knew was gonna drive our success in this transition. The combination of Schwab personnel and Dynasty personnel, they were there to keep me comfortable, keep me calm and that was super comforting. If you wanna be independent and you’re committed to being independent, and that’s what you believe, don’t let anything stop you from doing it. There’s nothing that should hold you back. I mean, I am so passionately a believer that the independent registered investment advisor platform is the way to build a successful business. I knew I was building my own business. It was mine, that I owned it along with my brother and my father. All of the work that I was putting into it was something that was building a firm that I owned. Well, imagine coming into an oﬃce and having two of your sons there every single day. I’m the luckiest guy at the table, believe me. Concentus Wealth Advisors is not owned by or affiliated with Schwab, and its personnel are not employees or agents of Schwab. This video is not a referral to, endorsement or recommendation of, or testimonial for the advisor with respect to its investment advisory or other services. Dynasty Financial Partners is a partnership of independent wealth management firms and one of many consulting options potentially available to transitioning advisors. Dynasty Financial Partners and their employees are not affiliated with or employees of Schwab. Their mention should not be construed as a recommendation by, endorsement of, or sponsorship by Schwab. The views expressed are those of Concentus Wealth Advisors and are provided for informational purposes only. Experiences expressed are no guarantee of future performance or success and may not be representative of you or your experience. You must decide whether to hire any firm and the appropriateness of their services for you or your firm. Your independence. Supported by Schwab. We have a solid foundation built on a diversified business model and a proven track record. More than 7,500 independent RIAs choose Schwab Advisor Services for trading and for operational and custody support. Our local service model; the strength of the Schwab brand; access to a range of insights, resources, and events; and our business consulting services are just some of the reasons why. Talk with Schwab Advisor Services about your questions around becoming an independent RIA. There’s never been a better time to go independent. If you have questions, would like to discuss options, or are interested in working with Schwab Advisor Services, complete the form below and a representative will contact you within two business days. You’re one step away from getting your essential guide to becoming an RIA. Call us at 877-687-4085 with any questions you have along the way. 5. 2018 RIA Benchmarking Study from Charles Schwab, January–March 2018. Median results for all firms $250 million or more in assets under management (AUM). Studay contains self-reported data from 1,261 firms. The data was not independently verified. Participant firms represent various sizes and business models categorized into 12 peer groups—7 wealth manager groups and 5 money manager groups—by AUM size. Past performance is not an indicator of future results. 6. 2018 RIA Benchmarking Study from Charles Schwab, January-March 2018. 7. As of June 2018. The mention of the above third parties is not, and should not be construed as, a recommendation, endorsement, or sponsorship by Schwab. You must decide whether to hire any firm and the appropriateness of their services for you or your firm. Schwab does not supervise third-party firms and takes no responsibility to monitor the services they provide to you. Institutional Intelligent Portfolios® ("IIP") is a technology and service platform made available by Schwab Performance Technologies ("SPT") to independent investment advisors ("Advisors") who maintain a business relationship with Schwab Advisor Services™, a division of Charles Schwab & Co., Inc. ("Schwab"). IIP is used by Advisors to provide their clients with an automated investment management service. Schwab, a registered broker-dealer and member SIPC, provides custody, trading and support services. Brokerage products, including the Schwab One® brokerage account, are offered by Schwab. SPT and Schwab are separate companies affiliated as subsidiaries of The Charles Schwab Corporation, but their products and services are independent from each other.